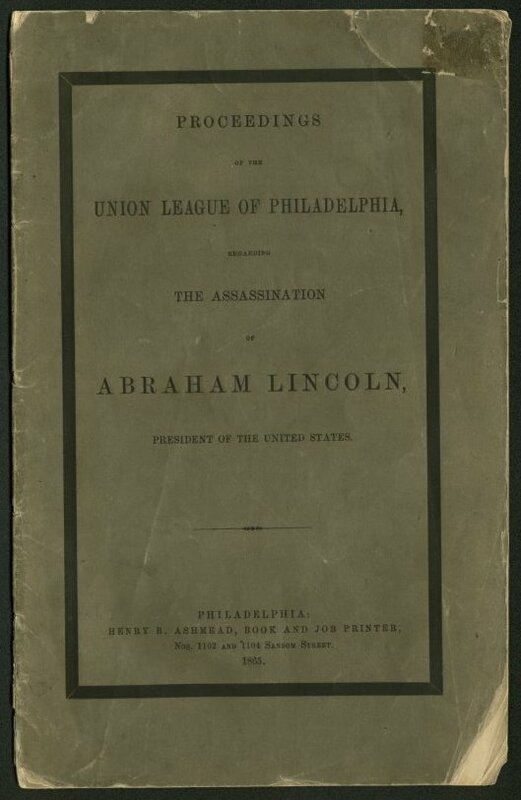 Proceedings of the Union League of Philadelphia regarding the Assassination of Abraham Lincoln, President of the United States. This pamphlet includes the meetings and proceedings of The Union League of Philadelphia after the assassination of President Lincoln. The Board of Directors met on April 15 "immediately after information had been received of the murder of the President..." and a special meeting was held on April 17 for all members. Several members spoke about the impact of the President's death, the evils of slavery and its role in his death, God's Providence, and the best ways to honor and mourn Lincoln. During this meeting on April 17, the League commissioned mourning badges for League members and their families to wear for the month following Lincoln's death. A full scan of this pamphlet is available through the Internet Archive, www.archive.org.